This simple and modern design plant stand set can easily adapt into any of your decor style. It fits into corners to brighten up dark spaces, or on a front porch to welcome visitors. The set of two different sizes creates a more interesting balance for your space, and makes planting less convetional. Buy this value pack of two to grace any space with greenery and flowers. MODERN PLANT STAND FOR YOUR DECOR: This cool iron plant stand set is perfect for both indoors and outdoors: living room, entryway, patio, garden, portch, etc. BRIGHTEN UP DARK CORNERS: Fill the plastic planters in the decorative plant stands with colorful flowers or long stems to brighten up your home. STURDY AND DURABLE: These plant stands are made of iron to last, and the plastic planter sits snugly into its space to eliminate accidents. 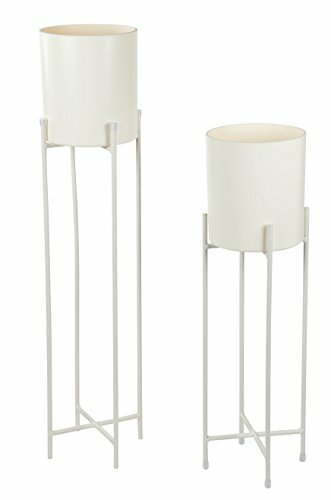 DECORATIVE AND ELEGANT: The simple lines and elegant design of this modern potted plant stands will fit in at a front door or in a garden. DIMENSIONS: Larger plant stand is 29.3 x 7.2 x 7.2 inches. Smaller plant stand is 23 x 7.2 x 7.2 inches. Planter measures 7.1 x 6.4 x 6.4 inches.